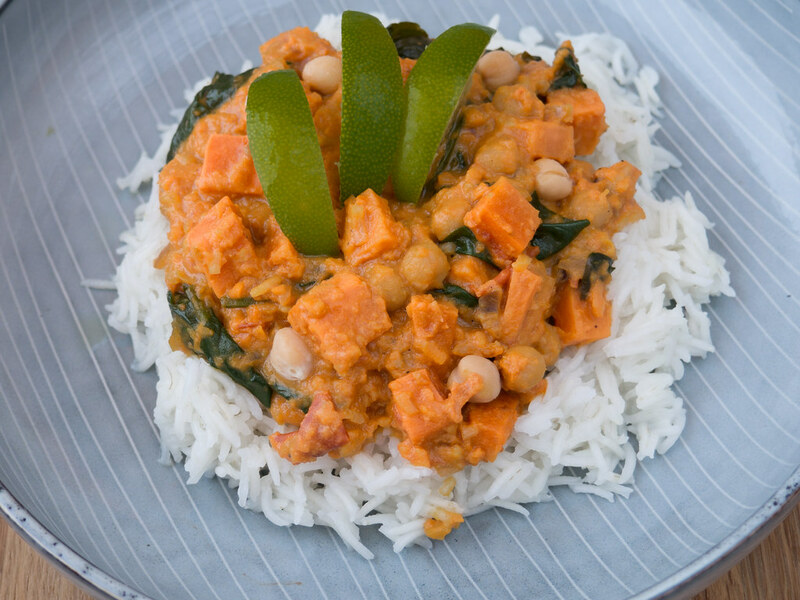 This recipe for a Sweet potato, Spinach, Chickpea and Coconut Curry is without doubt on my top-3 list of favorite vegan dinner dishes. The dish is actually really easy to prepare and it only takes about 45 minutes which is including 30 minutes of simmering time – time you can use to talk with your spouse, your kids or maybe just to relax after a long day at work. Besides being very easy to cook, it is also a very delicious and a good tasting dish. 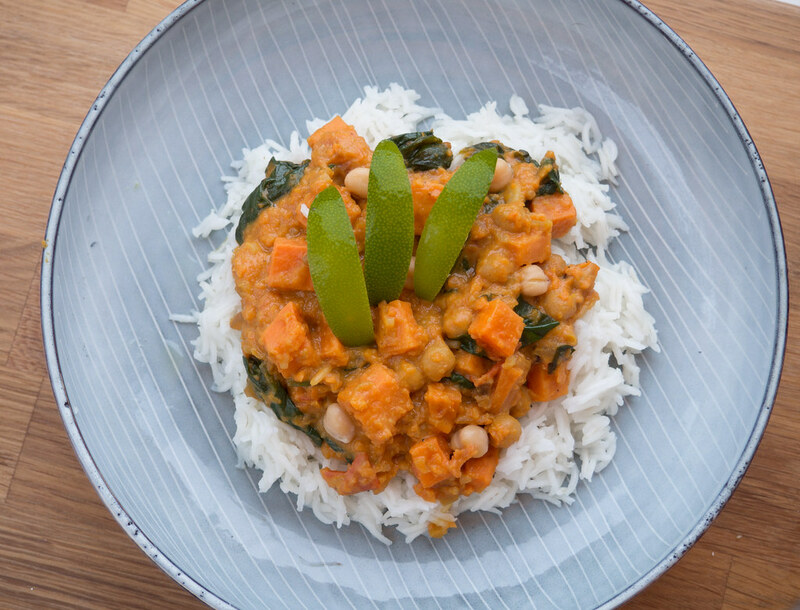 The soft sweet potato, the spinach, the semi-crisp chickpeas and the coconut curry is just a wonderful combination, if you ask me. 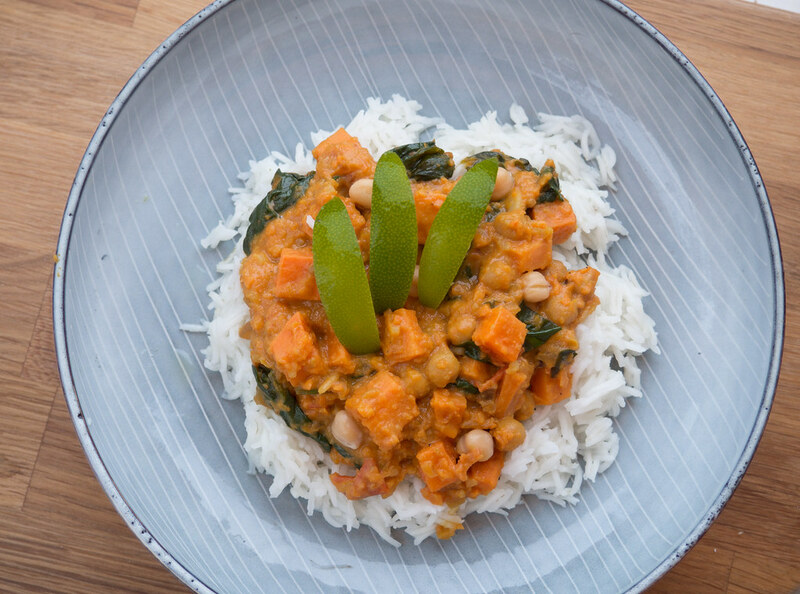 Therefore, it is a great dish if you are looking for something easy, tasteful and also vegan – I can absolutely recommend this dish. I normally serve this curry with white rice. However, it is also very recommendable to you brown rice which has a higher content of dietary fiber which is good for your body. If you are interested in other vegan dishes I can highly recommend my One Pan Mexican Quinoa which is probably my most favorite vegan dish. It is super tasteful and packed with great protein – overall a very filling and easy-to-cook dish. As mentioned in the section above, this recipe is quite easy to follow. 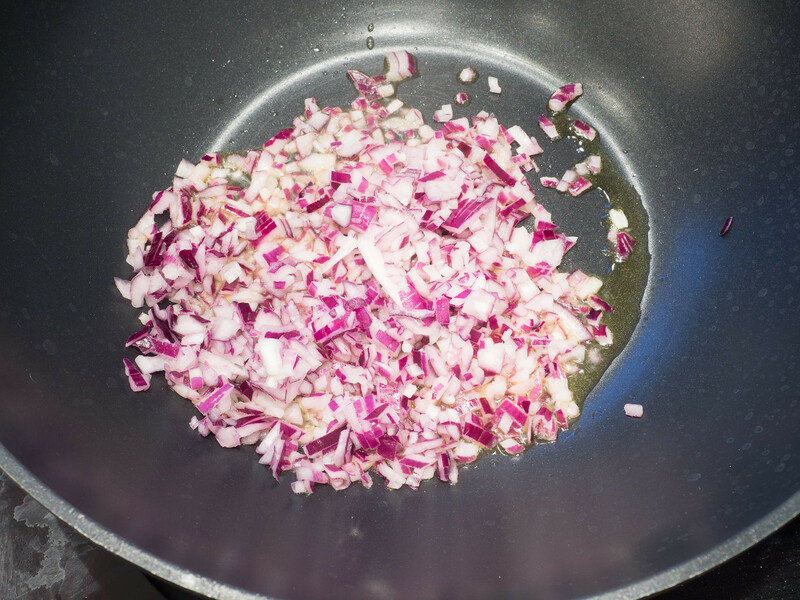 You start by frying the onions and the minced garlic in some coconut oil for a couple of minutes until the onions starts to become translucent. 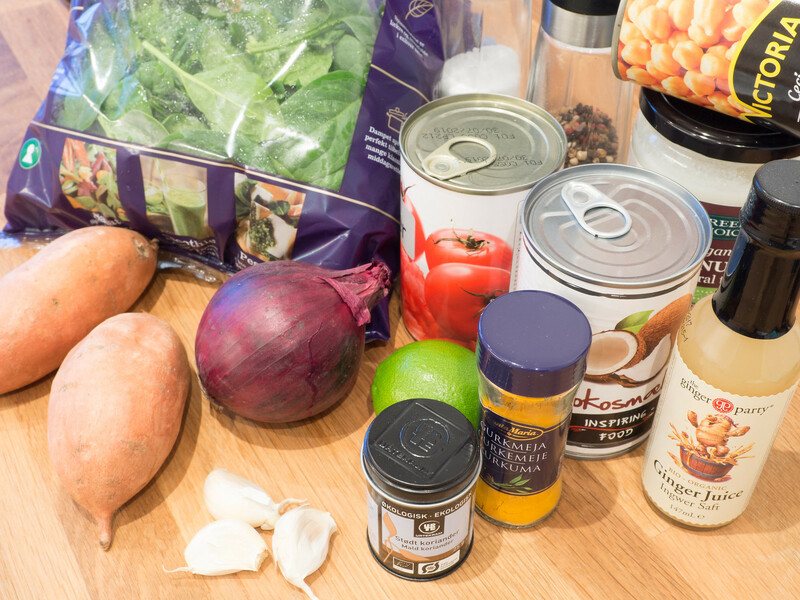 Then add the grated ginger (or similar ginger juice), Turmeric, coriander, cumin, red pepper flakes and salt – fry for a couple of minutes and then add the diced sweet potatoes, drained chickpeas, diced tomatoes and coconut milk. Let everything simmer for about 20-30 minutes. A couple of minutes before simmer time is done, add the spinach leaves and let them heat up and shrink in size. When done, serve this curry together with some rice. 1. In a large sauce pan; add the coconut oil, heat it up and let it melt. 2. Peel and finely dice the onions and fry them in the coconut oil until they are golden and translucent. This frying takes about 3-5 minutes. 3. 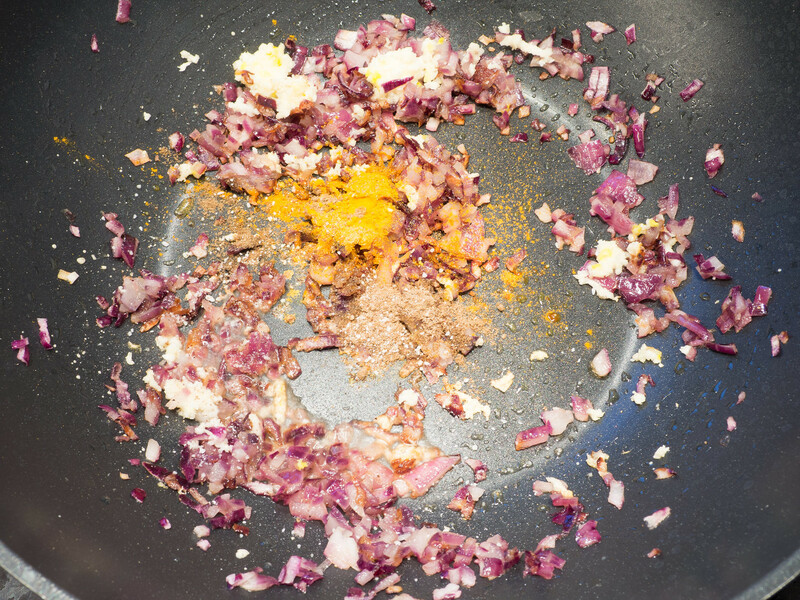 Add the finely minced garlic, grated ginger, turmeric, coriander, cumin, red pepper flakes and salt. Fry to combine everything for another 2-3 minutes. 4. Peel the sweet potatoes and dice them (6×6 mm or 1/4 inch). Drain the chickpeas and rinse them in cold water. 5. 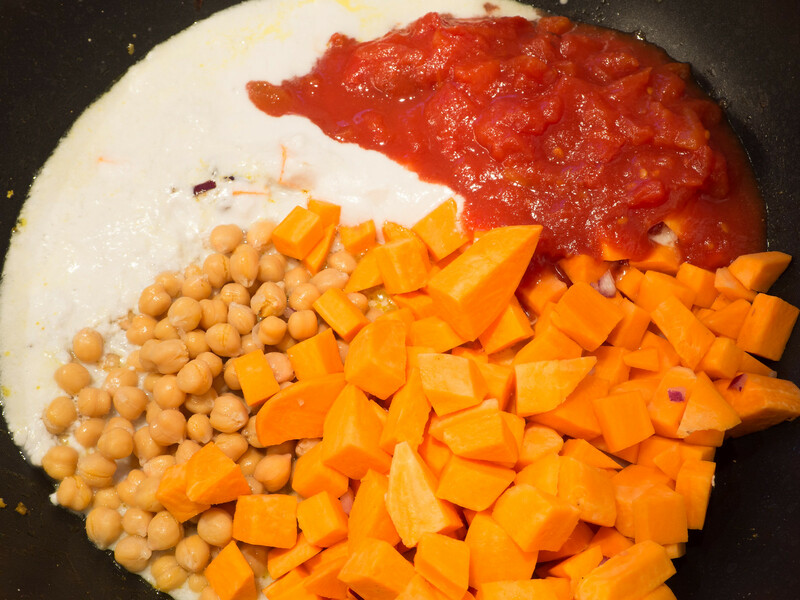 Add the sweet potatoes, chickpeas, diced tomatoes, coconut milk to the sauce pan. Let all the ingredients simmer under a lid, at low-medium heat and for about 20-30 minutes. 6. Using a hand blender to blend about 1/3 of the ingredients directly in the sauce pan. You can skip this step if you prefer a coarser dish. 7. Rinse and clean the spinach baby leaves and add them to the sauce pan. Gently stir to combine. 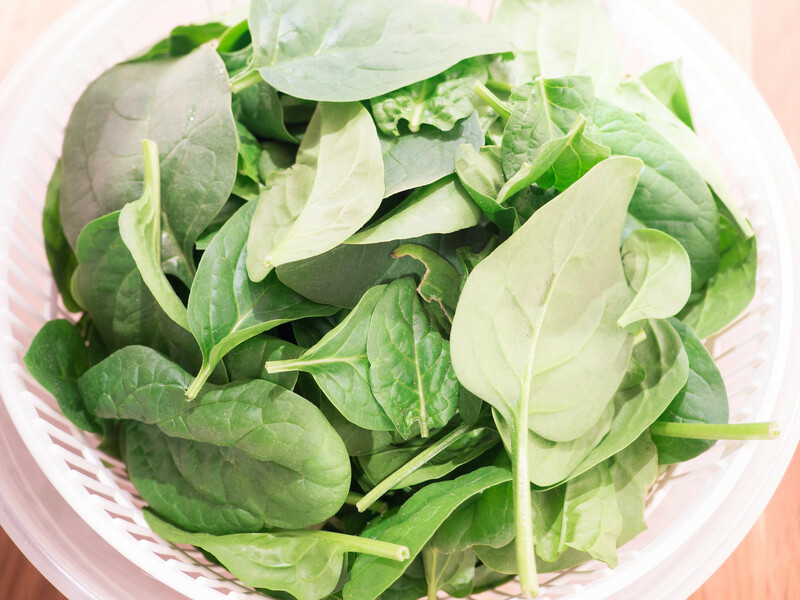 Let the spinach heat up and shrink in size. 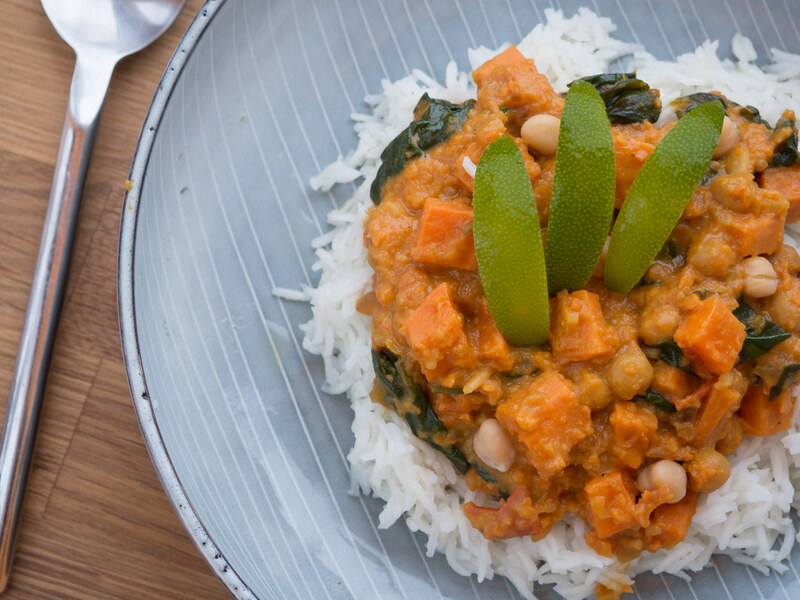 Tip: Serve this dish with freshly cooked rice. As topping use coconut flakes, freshly chopped coriander and lots of lime wedges. Absolutely delicious, doubled the recipe. Thanks! 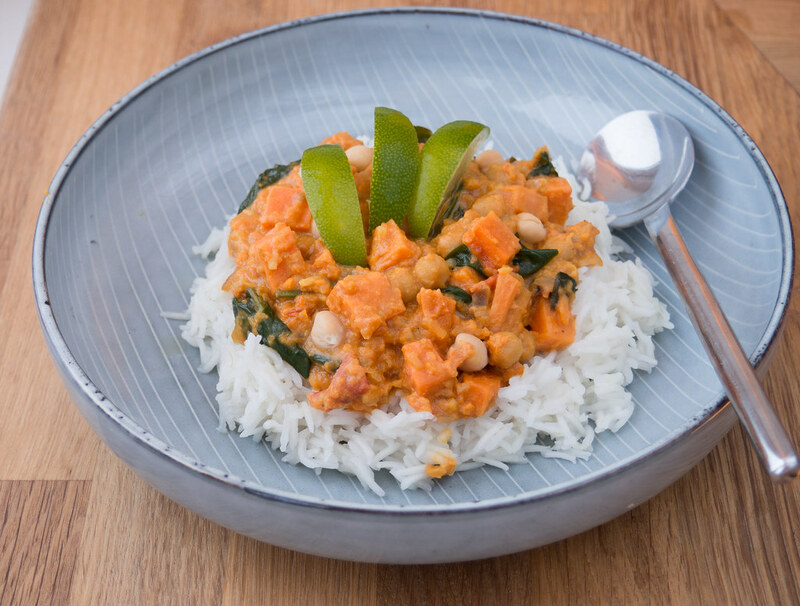 Made exactly to the recipe and the outcome was a beautifully flavoured curry that even meat eaters will love! So glad I found this recipe, thank you. I’m happy that you like the recipe. It’s also one of my favorite.